While we at CIMSEC were debating another U.S. Navy procurement program people love to hate, Britain was making news with a major F-35 decision. Ultimately the decision showed a sensible prioritization of operational availability over top-end capabilities. 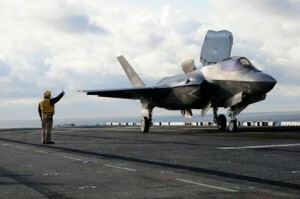 The U.K.’s Defense Secretary announced to Parliament on Wednesday it was swapping Joint Strike Fighter procurement for the Royal Navy from the F-35C carrier version to the F-35B short take-off and vertical landing (STOVL) model it had originally planned to buy. The Ministry of Defense gave the cost of installing the electromagnetic catapults on the two Queen Elizabeth-class carriers (now estimated at $3.2 bil.) as the prime motivator. It will outfit the carriers with skijumps instead. On the plus side, this decision reduces immediate budgetary pressures on Britain’s armed forces (including calls to scrap the second carrier) and will move up the timeline of Britain’s new aircraft carrier strike availability from 2023 at the earliest to 2020, with (scheduled) tests off the HMS Queen Elizabeth in 2018. The U.S. Marine Corps and Italy, prior to Wednesday the only other purchasers of the ‘B,’ will also warmly receive this decision as it should help secure the viability of the variant and bring in some small additional economy-of-scale benefit to their buys. The switch has some downsides for Britain. First, the F-35B compares unfavorably in a few categories of concern for a Navy, particularly an expected combat radius that’s at least 200nm less than its sibling, limiting the reach of Britain’s maritime power projection. Second, the decision reduces the cooperation potential of French fighters flying from British carriers hyped in the 2010 Franco-British defense treaties. And there are other compatibility issues created by the decision. It limits the models of important support aircraft that can be flown from the carrier’s decks (I hear something like the Growler can be handy). Additionally, while there is some work being done on STOVL UAVs, catapult-launched UAVs are the focus of the U.S. Navy’s future carrier strike fighter efforts, limiting the potential future utility of Britain’s new carriers if and when it decides to go pilotless. On the whole opting for operational availability over greater capability is a sensible move for the Royal Navy given current budget realities. The Royal Navy gets its carriers strike capability three years early, is much more assured of always having at least one carrier operational, and will no longer need French agreement on drydock and refit periods. Previous PostIran and America: May I Have This Dance?Next PostHappy Mothership Day! LockMart was feeling secure no matter which way the MoD jumped. Staying with the C meant there were (two albeit mis-matched in size) customers, and going with the B expanded the number of declared buyers for the variant most vulnerable to a program cut. As long as the Brits bought Made In America, all was well. Or is it? It’s not just EW a/c they can’t operate – they won’t be able to field a true AEW capability as well – helos can’t compare to altitude bands, range and time aloft that a fixed wing radar plane can. We’ve known for years the value that four Hawkeye bring to a strike group. Other considerations – high and hot environments (i.e., Far East and SWA) are hell on STOVL jets – you can’t carry as much fuel/loadouts as you could in more temperate climes. I think the jury’s still out on whether HM Treasury would really save 1.05B pounds up front only to pay through the nose later to retrofit or buy alternative systems to make up what they lost on an angled deck. Interesting notes about the environmental factors, and I definitely agree the jury’s out on whether this will be a cost savings over the long run or not. I think the major gamble is that this is enough savings upfront to allow the Royal Navy to keep 2 carriers while paying for it later. Essentially an installment plan that might be more palatable to the voters (even if it had been able to keep both, remember only one was to have F-35s, the other helos). I’m trying to find authoritative counter-estimates of how much work has already gone into Queen Elizabeth’s catapult system and how much time it will take to undue it. For every Sharkey’s World, there’s also a ThinkDefence: http://www.thinkdefence.co.uk/2012/05/raasons-to-be-cheerful-part-b/ As a result I tend to take the MoD’s word as the average of the two sides of the debate (but please let me know if you find counter evidence). That’s not saying I don’t think the timeline will shift to the right – that’s almost certain. But I’m of the mind that the Queen Elizabeth’s entry into service would shift regardless of CATOBAR or skijump. Either way, it’s going to be a long slog for the RN to maintain proficiency. With the queue pretty full at the F-35 Schoolhouse in Eglin (and only the 24th and 25th units respectively being delivered in the LRIP Wave 1), at some point they have to induct the Level 1 and 2 partners’ pilots to get acquainted with the new steed. So we have RN pilots in exchange programs with the USN and the French Navy to keep the perishable knowledge intact. The shift to the B model now puts the load on the USMC side of the base to deliver that partner’s training. It’s kind of interesting that the RN pilots who will eventually be trained for JSF aren’t even flying right now, heck, they might have not have even graduated from Fifth Form (high school). The guys flying now will eventually occupy command slots but will have never known flying the fighter type that they will be in charge of. This is a huge diplomatic loss for the franco-british defense pact. Without the EMALS, the Rafaeles and other French carrier aviation cannot take off from the QE class. The Brits simply do not have the birds, nor will they, to have a 1.0 carrier presence operational availability. The F-35 C will go down in military procurement history as the largest mistake we ever made. the Marines needed an A-10. We gave them an F-22 instead. Brilliant. The second and third order effects will keep on coming!